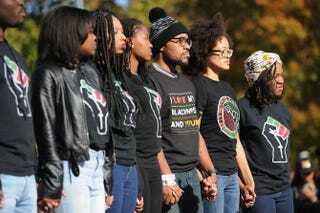 Students on the campus of the University of Missouri in Columbia in November 2015 celebrate the resignation of University of Missouri System President Tim Wolfe amid allegations of racism. After threats of violence surfaced online this week against black students at the University of Missouri, a local NAACP chapter has opened a confidential telephone hotline that will allow students to report threats immediately, according to the Huffington Post. The NAACP's Jefferson City branch said Friday that students can call 844-NAACP-HELP if they need assistance. Nimrod Chapel, president of the Jefferson City NAACP, told the news outlet that the number is for students who may not feel comfortable reporting threats to law enforcement, which has an "abysmal" record of prosecuting hate crimes. "If you look at the history of the Civil Rights Movement, when concessions are made for equality and respect for human dignity, there have always been individuals who feel as though their liberty is being stifled," Chapel said in a statement to HuffPost. Minority students at the school have faced increased threats since university President Tim Wolfe resigned Monday amid protests over the school's handling of several racist incidents. Chancellor R. Bowen Loftin also stepped down later in the day and will transition to a new position in January. The hotline is available to students on the university's campus and in surrounding areas.